Home > Accessories > Children's Book "Skating History"
Every skater in Skateland is excited about the upcoming show devoted to the history of figure skating. Except Cammie. She hates practicing boring figures and participating in an old-fashioned group number. But when Cammie’s roommate—the show’s star performer—goes missing during the dress rehearsal, Cammie is ignited with passion to rescue her friend at all cost. She learns of a magical skating history book that can transport people back in time. Cammie suspects foul play by the evil skating witches and, with the help of her best friend Alex, travels back into time to rescue the missing skater before it’s too late. 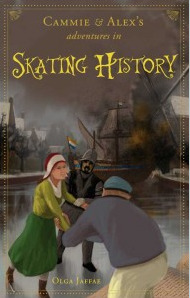 Readers will love learning ice-skating history as Cammie and Alex travel to sixteenth-century Holland and nineteenth-century England, meeting famous skaters such as Jackson Haines, Sonja Henie, and Ulrich Salchow. Will this be the end of Cammie, Alex and their friend? You will find the answer in Cammie and Alex’s Adventures in Skating History, Olga Jaffae’s third book in the Skateland series.